For those who value healthy living and eating, this Panasonic combination steam and microwave oven is a long-awaited necessity. Super-heated steam is generated in the oven cavity, cooking your food in a way that requires no fats. Combine healthy steam technology with the grill, roast or microwave functions for dishes that come out crispy on the outside and tender, juicy and flavourful on the inside. Enjoy the convenience of a traditional microwave with the benefits of steaming, like increased vitamin preservation and a lower calorie count. Powerful steam enables speedy, professional steaming, making it easy to prepare delicious, healthy, oil-free dishes. Steaming can also be combined with grilling, oven and microwave cooking to greatly expand the variety of foods on your family’s table. Both sides of the meal can be browned without turning it over. The upper heater and microwave-heated Grill Tray cook food quickly from both top and bottom. As it cooks, excess fat is drained off by the grooves in the Grill Tray. Food remains crispy on the outside and juicy on the inside. Panasonic's original Inverter Technology allows continuous microwave power to be used together with the oven heater. With previous models, the microwave and the heater had to be alternately switched on and off. Panasonic's simultaneous combination cooking reduces cooking time to two-thirds. 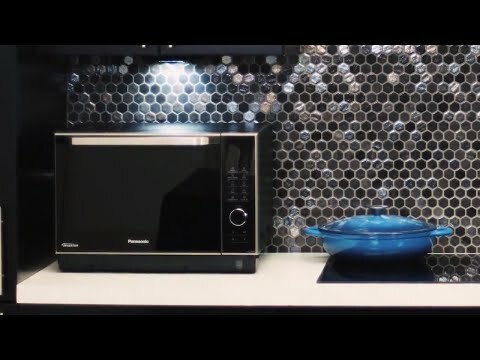 Conventional microwave ovens operate on only one power level – fully on or off. Panasonic Inverter Technology delivers graduated power sequences continuously so food is cooked more evenly, with more delicious results.